Present your report, project or artwork in style with this presentation book. Protect important documents, while creating a presentation book in minutes. Using the presentation book can help reduce time spent on creating a professional-looking hand-out. Instead, present your report, project or artwork in style with this presentation book. Features twelve bound-in clear top-loading polypropylene sheet protectors that lie flat while the book is open. Storage pocket on inside front cover holds extra materials. Clear-view spine insert is reversible for instant customization or visit the Template Gallery to create your own spine insert. Holds up to 24 pages. Acid-free. Black. 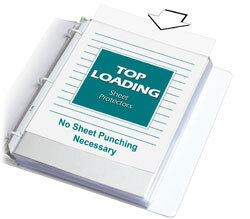 Sheet Protector Special Features: Sheet protectors are bound into a professional presentation book. Suggested Use: Create a professional report or project in minutes.